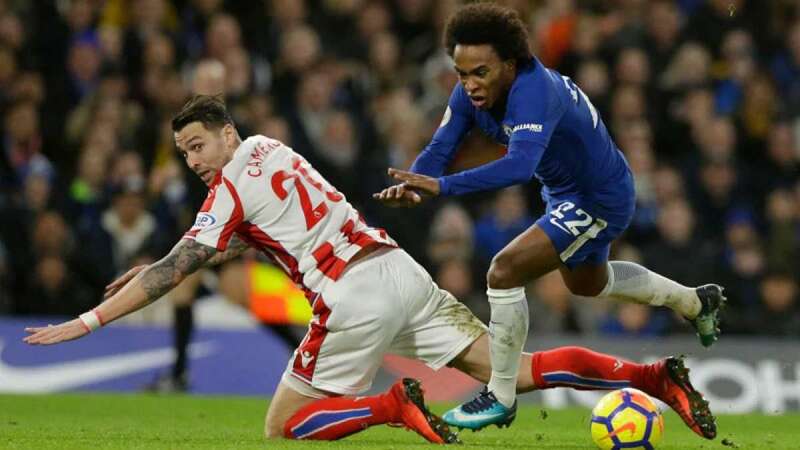 London : English Premier League defending champion Chelsea routed Stoke City 5-0, while Liverpool had to rally from one goal down to earn a 2-1 win over Leicester City. Chelsea's Belgian star Eden Hazard was left on the bench amid speculation about his contract extension, reports Efe. Chelsea, however, did not face a real challenge against a rival on Saturday which won just one out of its last six league games. German Antonio Ruediger got Chelsea on the scoreboard three minutes into the game with a header off a cross from Brazilian Willian. Danny Drinkwater doubled the tally with a shot on the edge of the area in the ninth minute. Spaniard Pedro scored Chelsea's third goal with a shot on the verge of the area in the 23rd minute set up by Willian, who added the fourth goal, converting a penalty in the 73rd minute. Minutes after going in, substitute Davide Zappacosta scored Chelsea's fifth goal with two minutes to go before the second half stoppage time. After the win, Chelsea jumped into second place in the EPL standings, with 45 points, after Manchester United drew for the third league match in a row, this time against Southampton 0-0. Egyptian Mohamed Salah, meanwhile, led Liverpool's comeback for a second consecutive league victory, extending Leicester's drought to four matches. Leicester took the lead in the third minute, thanks to a goal from Jamie Vardy, but a brace from Salah in the 52nd and 76th minutes was all Liverpool needed to win. Liverpool holds fourth place in the standings with 41 points. In other Premier League action on Saturday, Bournemouth defeated Everton 2-1, while Swansea City won against Watford by the same score. Huddersfield Town drew 0-0 against Burnley and Newcastle United played to a 0-0 draw against Brighton & Hove Albion.